Hotel Caravaggio is a smart and friendly three-star hotel with excellent reviews from past guests. 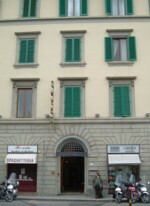 It is located at a short walk from Florence's main railway station, and is a convenient and comfortable place to stay. I stayed anonymously at Hotel Caravaggio for one night in April 2005. After reading the fulsome praise of past guests, I was interested to see how much this three-star hotel could really offer. Tired and sweaty from my journey, I drag my suitcase down Via Nazionale towards the hotel, wishing that the Florentines had made their pavements a bit wider. As soon as I enter the Caravaggio I can see why it has such good reviews. The reception area is bright, smart and welcoming, the English-speaking receptionist is friendly and helpful. Although I've arrived before midday, he rings housekeeping and confirms that my room is ready. And when I see the room I wish I were staying here longer. The single room is spacious, well-furnished and nicely-decorated, with large windows opening onto a view over gardens at the back. The housekeeping staff have done their job well; it's spotless and pleasantly-scented. Facilities include air-conditioning, television (with channels in a range of languages including English), safe, minibar and a suitcase stand. The furniture (wide single bed, desk, chair, wardrobe) all has a pleasant solidity and the furnishings give a general sense that this is a traditional hotel run with care, experience and attention to detail. The sweets in a dish on the desk are a very nice touch (and I eat the lot). My ensuite bathroom is sparklingly clean and well-equipped, with a good shower (but no bath). There's a pleasant little bar downstairs where I settle with a large pot of tea after a tiring afternoon sightseeing (and on check-out, I'm pleased to see that I am charged a reasonable €1.80 for this). Next to the bar is a small lounge with a television and an internet point. Breakfast is generous by Italian standards: hot drinks, fruit juice and a good selection of cereals, rolls, croissants and cold meats. The other guests I see are all tourists, mostly non-Italians like myself. The facilities and comfort levels at the Hotel Caravaggio are hard to fault, while staff are all friendly and obliging. The location is pretty good both for the station and for Florence's tourist attractions, although the hotel's not in the heart of old Florence. I wouldn't hesitate to recommend the Caravaggio to even the most picky of overseas visitors as a good place to stay. Hotel address: Piazza Indipendenza, 5. From Santa Maria Novella railway station, walk left to cross the ATAF bus station, then walk to the right, alongside the bus stops to Largo Alinari (past the fast food restaurant). Turn left and continue along Via Nazionale. The hotel is on the right when you reach Piazza Indipendenza. The walk takes about ten minutes. Hotel Caravaggio review by an Italy Heaven editor.